Thanks for some more great ideas Graham. 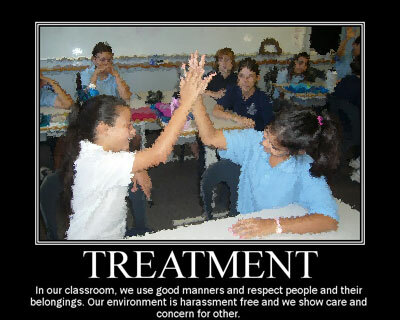 I like the idea of using the motivational poster tool to display visual examples of class rules / expectations. We start school tomorrow so your ideas have been a bonus for me and helped me get motivated towards completing my ‘planning’ for the first term! I love the idea of these visual reminders including photos of the students. I think this can be much more encouraging and real when students see themselves within these posters. Great work. Just thought to add that another measure I took with my class (a very disparate group of yr 7 and 8) was to have them take ownership of this term’s seating plan. I asked them to make decisions based on considerations like friendships, buddying up with students new to our school/class, and the biggy – how many positive points they wanted me to add to their school diary (as opposed to negative points…these all add up for further action/rewards) Enough of them wanted to make a good start that we ahve a seating plan that has fulfilled the criteria, with only one or two ‘hot spots’ for me to keep an eye on. Nice to see you back in action Graham. I love the ideas using the posters. I have been using the bighugelabs magazine cover to create some interesting cover pages for this years electronic portfolios. Keep pushing forward. Enjoy your year. LG just has to cope with the “Techie” that keeps sticking his head in the window, or pulling faces at her through the door….. Bigger than any Hot Spot her class can dish up.